Rhubarb season is upon us–I've seen it popping up on grocery store shelves and in strawberry treats more and more over the last few weeks. I can't imagine better time to combine rhubarb with a bit of bubbly for a truly lovely spring cocktail, perfect for a celebratory brunch this weekend! In a saucepan, combine 4 stalks of roughly copped rhubarb with 1 cup of sugar and 1 cup of water. Bring to a boil over medium heat, stirring occasionally, until rhubarb is slightly broken down. Once syrupy, remove from heat and add mint sprig. Let sit for 1 minute, then strain and cool. 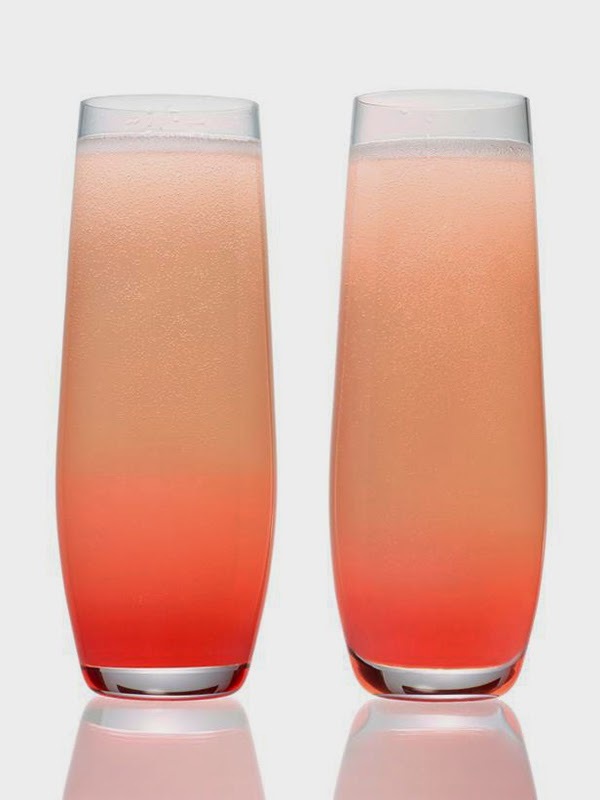 Add 1 to 2 oz rhubarb syrup to taste to a Champagne flute, then top with sparkling wine. Notes: This rhubarb-mint syrup would also be lovely with club soda or as a sweetener in a springtime margarita. Cheers! Image by Hang Kim for Food Network. I could use of these, right now!!!!! Anything with sparkling wine and I'm there! What a perfect springtime and early summer cocktail! Can't wait to try this one out.